I’m with E.B. White. I’m less worried about revolution than I used to be. Mostly because I’m slowly learning that when you have no time at home, there is absolutely no time for television. There is no time for coverage of silly people saying violent things. There is not enough time in the world for this waste of non-thought and anger and threats. The only healers are the outside air on your face, and wholesome food set before you. This vegetable grows all season, and aficionados claim that it becomes sweeter after frost, when the cold temperatures turn the plant’s starch into sugar. And so my reward for tending, harvesting and eating these leaves for months is to have an even more delicious leaf when all else has died back? No wonder I am less worried about revolution. Keep the silly politics and blither. Hang the elections. 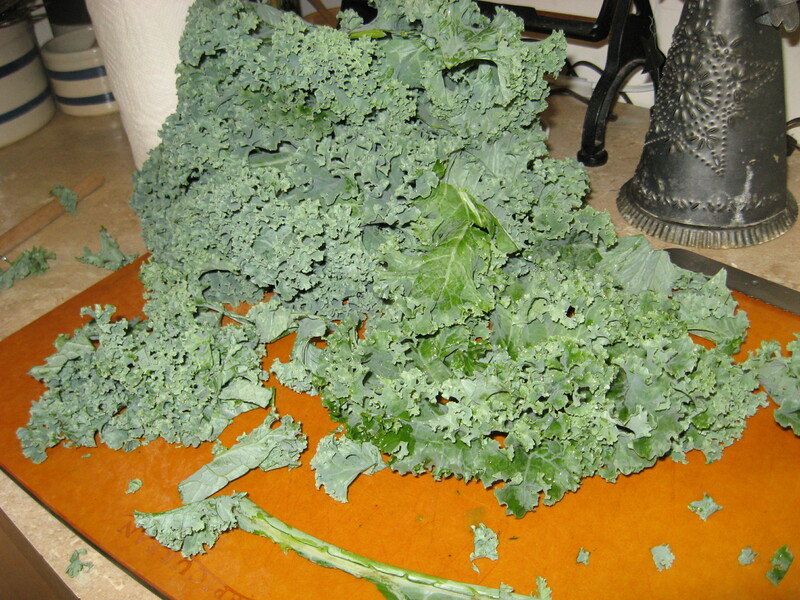 I’m going to make Crispy Kale, and other sweet savory dishes. First, bring in a heap of kale. 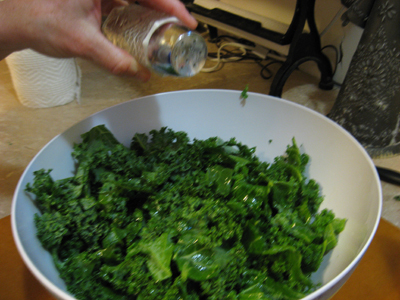 De-protein the kale -- we're talking veggies-only for this recipe. 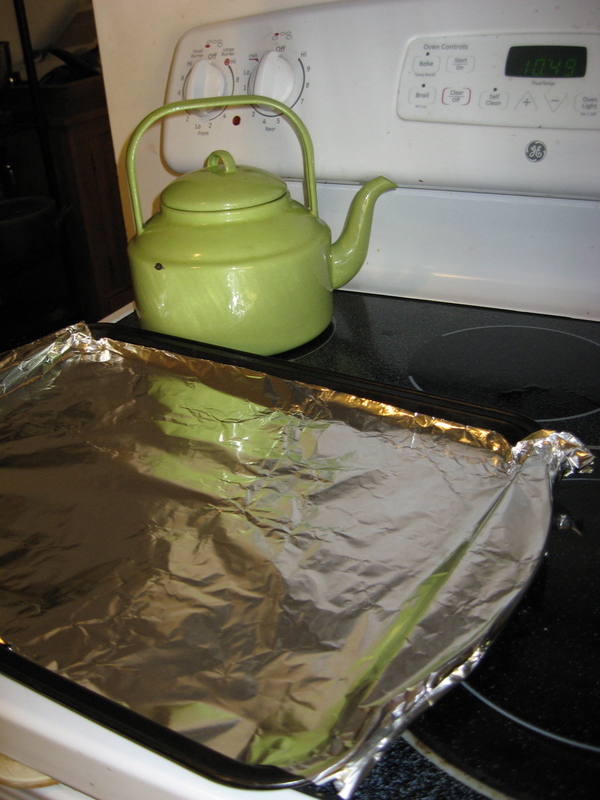 Preheat your oven to 500 degrees, and line a cookie sheet with foil. A photo of this highly-technical step. Remove the stem, and cut the leaves into ¼” ribbons. The tough rib has served its purpose, supporting the leaf, and now it is time for it to move on to the compost heap. The leaves gleam dark green with a light dressing of oil. Easy on the salt. If you load too many leaves onto the cookie sheet, they won't crisp-up. Bake for 5 minutes. Take the cookie sheet out of the oven, fluff up the leaves, and put the cookie sheet back into the oven. Bake for 5 more minutes. 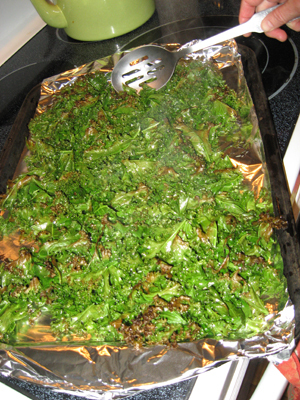 Take out dark green, crunchy kale leaves (sort of like potato chips, but more worthy of conversation). 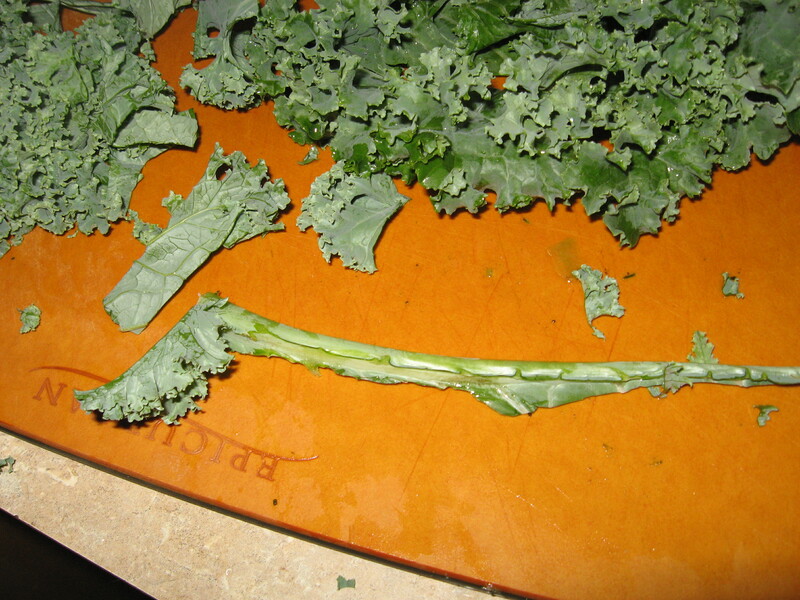 Remove the stem, and coarsely chop the leaves. Cook the leaves in simmering water for 15 minutes. — toast pine nuts in a dry pan until just browned and fragrant. Set aside. — grate some fresh parmesan and set aside. — sauté sliced garlic in olive oil until the garlic just begins to brown. Accept the compliments with grace.